Megan Kimble was traveling a long way to find the next chapter in her life, one that would not include her brother, Matt. Losing him now was tragic, even more so since she had finally freed herself from the abuse and the shame of a bad marriage. She had spent years hiding things from Matt, so he wouldn't know about her horrible life. Keeping her secret world of bruises, cuts, and broken bones, much like the one she now sported with a large white cast. Dealing with her loss was hard, but, now she was thinking of taking over Matt's new business venture. This could be the fresh start she needed, a new town, a new place to forget the pain and maybe she could learn to trust again. Todd Jordan was a successful businessman, who had once lost it all, and now he had just lost his best friend and business partner. But, then she came into town broken and scared, and for the first time in a long time he was looking forward to his future. Breaking down Megan's barriers would take patience and strength, and he would need that strength to keep what he loves safe. A Wonderful Character Series in a Great Setting! This was a wonderful book that will bring you to tears, laughter and a little bit of frustration while bringing you back to a warm, happy feeling. If you enjoy the types of books that really help you feel like you are a part of a community like the Cedar Cove Series, Thunderpoint Series and the like then you absolutely must read this book. I bought the entire series for my Kindle and can't wait to read the rest!!!! Terrific character development and the plot work was outstanding. I truly wish I could visit Pride, Oregon or even better to move there! Wow! What an amazing book. 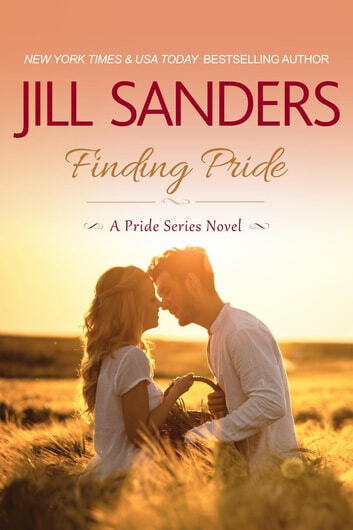 Finding Pride by Jill Sanders was beyond phenomenal. I personally adored the story and plot and characters. Jill Sanders wrote not only a phenomenal book but a very realistic book. I could not put this book down. I just kept saying one more chapter and before I knew it I had finished the book. In Finding Pride we get Megan Kimble and Todd Jordan's story. What an amazing story. Megan comes to Pride to heal in more ways than one. Todd is healing as well. Both Megan and Todd have suffered tragic and painful situations. When they first meet you can feel their attraction to one another. As the story progressed I really felt their struggles and their attraction. I could see their pain from their past hurts. As I read the book I felt as if I were a part of Pride and seeing everything not reading it. I loved the secondary characters and just felt their love and support for each other. This town was not just a town it was a community that was a family. Oh and may I say I really loathed Derek. I thoroughly enjoyed watching both Megan and Todd overcome their struggles and even grow together and individually. Jill Sanders is a phenomenal author. She captivated my heart from page one. I was mesmerized by this story and the plot and characters. I fell in love with Megan and Todd. I fell in love with the town of Pride. I found myself laughing and crying and even having heartswooning moments. I was even on the edge of my seat at moments. I felt as if Finding Pride was written for every woman out there. Finding Pride was a very refreshing read. I was sorry to see the book end. I loved it from beginning to end. Kudos Jill Sanders on an amazing book. I love the Authors writing style she not only entertains but transports you to a new world in the process. This story visits a small town with beautiful views and everyone feels like family. This visit revolves around a couple that have been drop-kicked by fate in very different ways. It starts off so sad I have to admit that it got to me and had me crying at the beginning. I was drawn in and invited my own emotions in the the outcome of this little town in the people in it. Todd is so strong and caring just what Megan needs even though she is so not looking. I look forward to more visits to Pride and getting to know the rest of the residents even better.